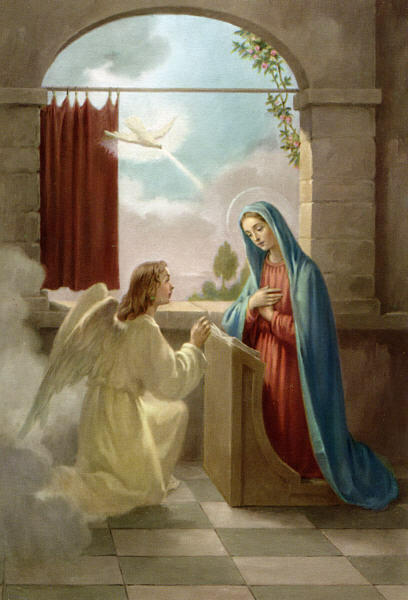 In the sixth month the angel Gabriel was sent by God to a town in Galilee called Nazareth, to a virgin engaged to a man whose name was Joseph, of the house of David. The virgin's name was Mary. 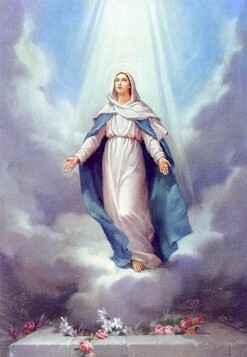 And he came to her and said, 'Greetings, favoured one! The Lord is with you.' But she was much perplexed by his words and pondered what sort of greeting this might be. 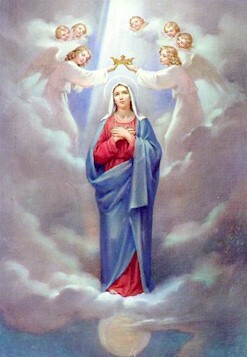 The angel said to her, 'Do not be afraid, Mary, for you have found favour with God. 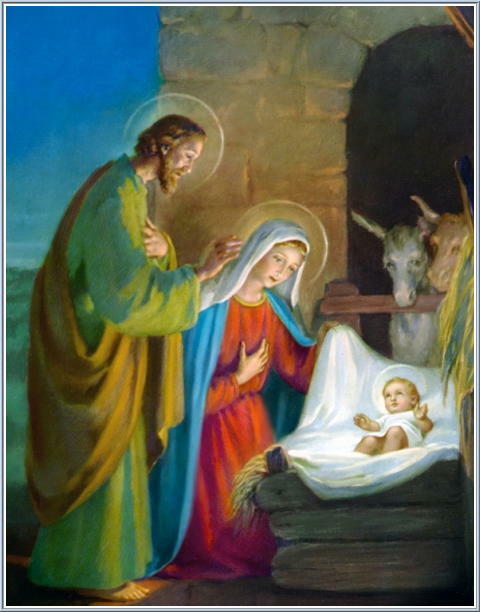 And now, you will conceive in your womb and bear a son, and you will name him Jesus. He will be great, and will be called the Son of the Most High, and the Lord God will give to him the throne of his ancestor David. 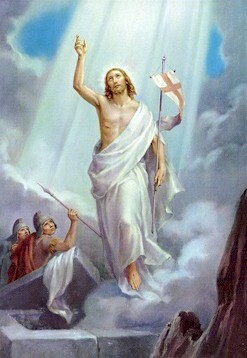 He will reign over the house of Jacob for ever, and of his kingdom there will be no end.' 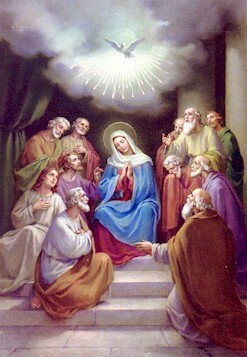 Then Mary said, 'Here am I, the servant of the Lord; let it be with me according to your word.' Then the angel departed from her. Now every year his parents went to Jerusalem for the festival of the Passover. And when he was twelve years old, they went up as usual for the festival. When the festival was ended and they started to return, the boy Jesus stayed behind in Jerusalem, but his parents did not know it. Assuming that he was in the group of travellers, they went a day's journey. Then they started to look for him among their relatives and friends. When they did not find him, they returned to Jerusalem to search for him. After three days they found him in the temple, sitting among the teachers, listening to them and asking them questions. And all who heard him were amazed at his understanding and his answers. When his parents saw him they were astonished; and his mother said to him, 'Child, why have you treated us like this? Look, your father and I have been searching for you in great anxiety.' He said to them, 'Why were you searching for me? Did you not know that I must be in my Father's house?' But they did not understand what he said to them. 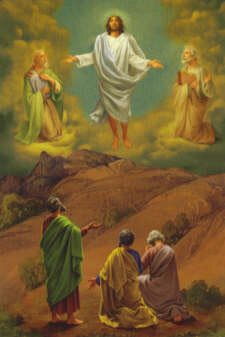 Six days later, Jesus took with him Peter and James and his brother John and led them up a high mountain, by themselves. 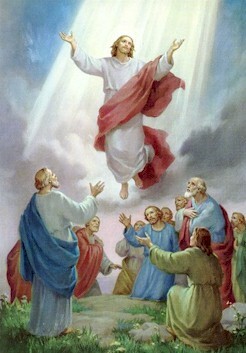 And he was transfigured before them, and his face shone like the sun, and his clothes became dazzling white. Suddenly there appeared to them Moses and Elijah, talking with him. 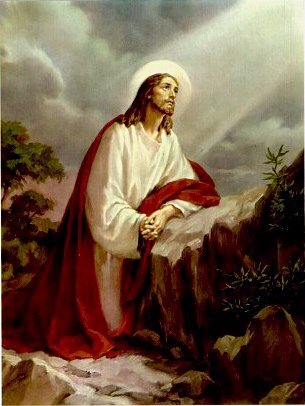 Then Peter said to Jesus, 'Lord, it is good for us to be here; if you wish, I will make three dwellings here, one for you, one for Moses, and one for Elijah.' 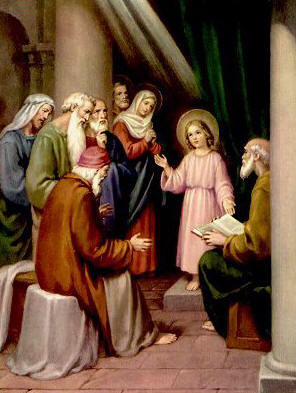 While he was still speaking, suddenly a bright cloud overshadowed them, and from the cloud a voice said, 'This is my Son, the Beloved; with him I am well pleased; listen to him!' When the disciples heard this, they fell to the ground and were overcome by fear. But Jesus came and touched them, saying, 'Get up and do not be afraid.' And when they looked up, they saw no one except Jesus himself alone. 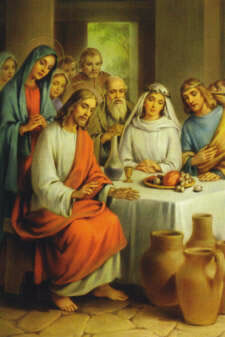 While they were eating, Jesus took a loaf of bread, and after blessing it he broke it, gave it to the disciples, and said, 'Take, eat; this is my body.' Then he took a cup, and after giving thanks he gave it to them, saying, 'Drink from it, all of you; for this is my blood of the covenant, which is poured out for many for the forgiveness of sins. Now at the festival he used to release a prisoner for them, anyone for whom they asked. Now a man called Barabbas was in prison with the rebels who had committed murder during the insurrection. 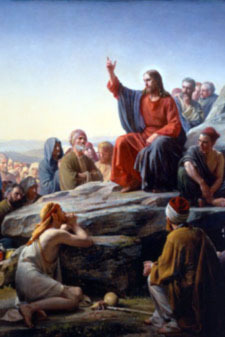 So the crowd came and began to ask Pilate to do for them according to his custom. Then he answered them, 'Do you want me to release for you the King of the Jews?' For he realized that it was out of jealousy that the chief priests had handed him over. But the chief priests stirred up the crowd to have him release Barabbas for them instead. 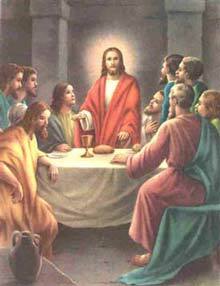 Pilate spoke to them again, 'Then what do you wish me to do with the man you call the King of the Jews?' 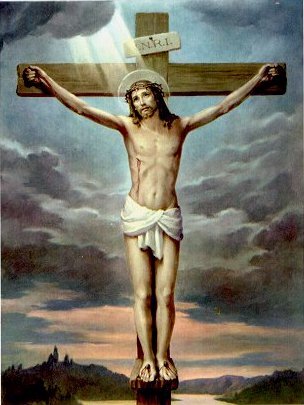 They shouted back, 'Crucify him!' 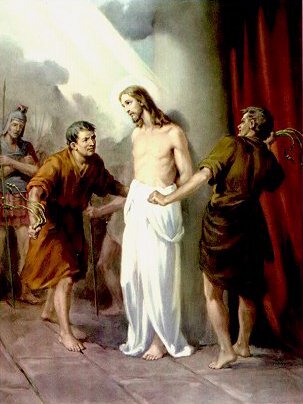 Pilate asked them, 'Why, what evil has he done?' But they shouted all the more, 'Crucify him!' 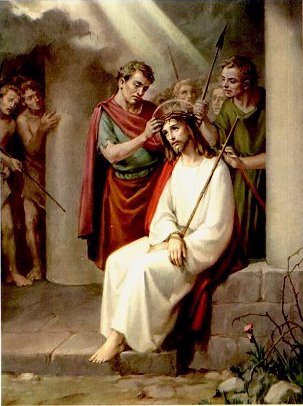 So Pilate, wishing to satisfy the crowd, released Barabbas for them; and after flogging Jesus, he handed him over to be crucified. 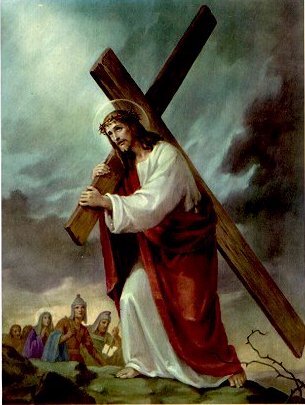 Meanwhile, standing near the cross of Jesus were his mother, and his mother's sister, Mary the wife of Clopas, and Mary Magdalene. 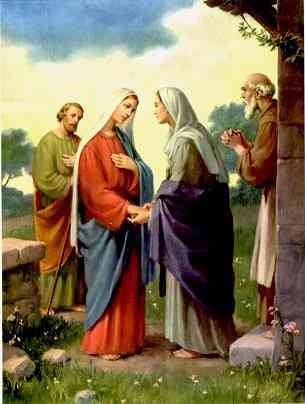 When Jesus saw his mother and the disciple whom he loved standing beside her, he said to his mother, 'Woman, here is your son.' Then he said to the disciple, 'Here is your mother.' 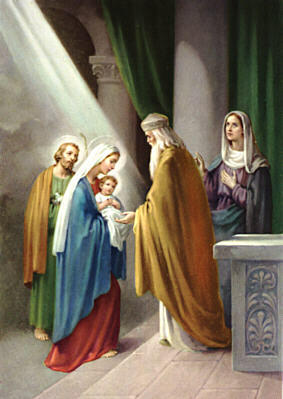 And from that hour the disciple took her into his own home. 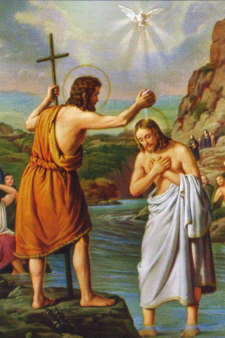 After this, when Jesus knew that all was now finished, he said (in order to fulfil the scripture), 'I am thirsty.' A jar full of sour wine was standing there. So they put a sponge full of the wine on a branch of hyssop and held it to his mouth. When Jesus had received the wine, he said, 'It is finished.' Then he bowed his head and gave up his spirit. Then God's temple in heaven was opened, and the ark of his covenant was seen within his temple; and there were flashes of lightning, rumblings, peals of thunder, an earthquake, and heavy hail.